For nearly nine hundred years the parish church of St laurence Norwell has been a place of worship. It has a long and interesting history much of which can be read in the church building. In the 21st century it continues to be a Christian presence in the parish (which includes Norwell Woodhouse) and is the venue for regular services and a range of other activities. Many visitors drop in to enjoy the history of the church. The church is open during hours of daylight and you are welcome to wander round the church and the churchyard with its grass labyrinth. A church with a priest is mentioned in Domesday book. Apart from a piece of an Anglo Saxon cross in the most westerly pillar of the north arcade, the Norman south doorway is the oldest part of the church and probably dates from the mid l2th century. Inside the church the pillars on the south side are circular and probably date from the late 12th century, those on the north are octagonal and date from the 13th century. There is information available in the church to explain other fascinating features such as the rood stairs and doorway, the green man in the north transept and two 14th century ephigies. There are regular services twice a month, with others taking place for a particular purpose. There is always a service of Holy Communion each month. Other services are particularly family friendly and include amongst others an annual pet service, Mothering Sunday, Harvest and a range of services at Christmas. On every fifth Sunday there is a joint Group Service with the other churches in the Benefice. There are close links with the Norwell Church of England Primary School and pupils come to the church for services and educational activities. The church building is large and is used throughout the year for concerts and talks. It is the starting point for guided heritage walks through the village (in association with Norwell Parish Heritage Group). It is the venue for a very lively Christmas Festival on the second Saturday in December- this includes stalls, displays and entertainment and well as seasonal refreshments. 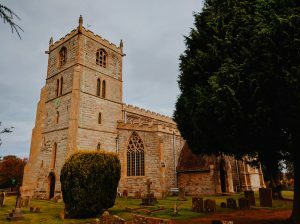 The church also hosts themed displays on the last Sunday in June when gardens are open in the village as part of the National Gardens scheme. Whether you are coming to visit the church or are joining us for one of the services or other activities, young and old (and in between) are assured of a very warm welome!